Oh Canada! 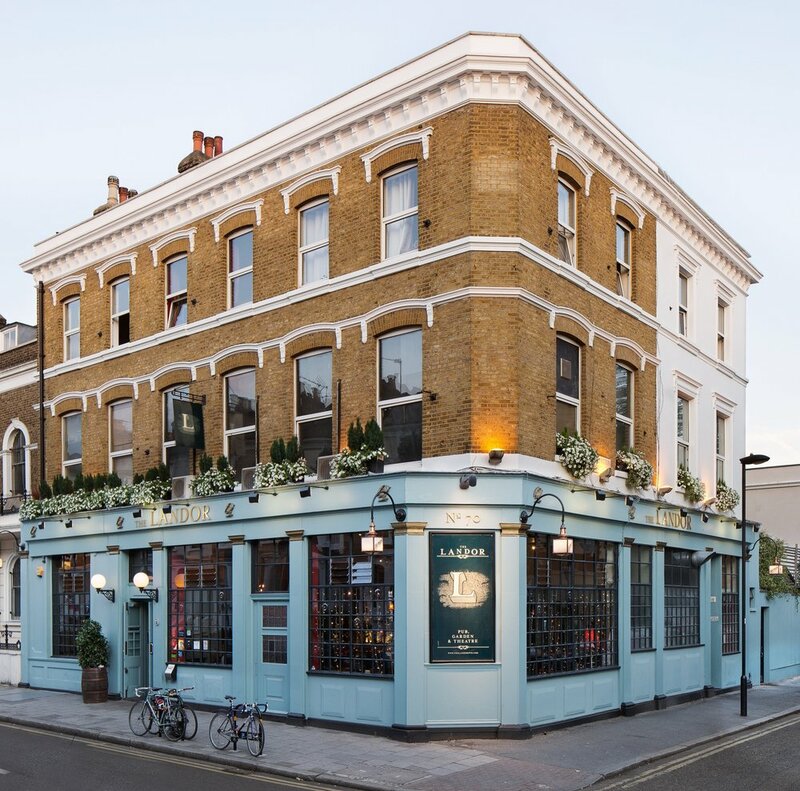 is a series of events promoting Canadian theatrical content and fostering the development of artistic relationships between the UK and Canada. 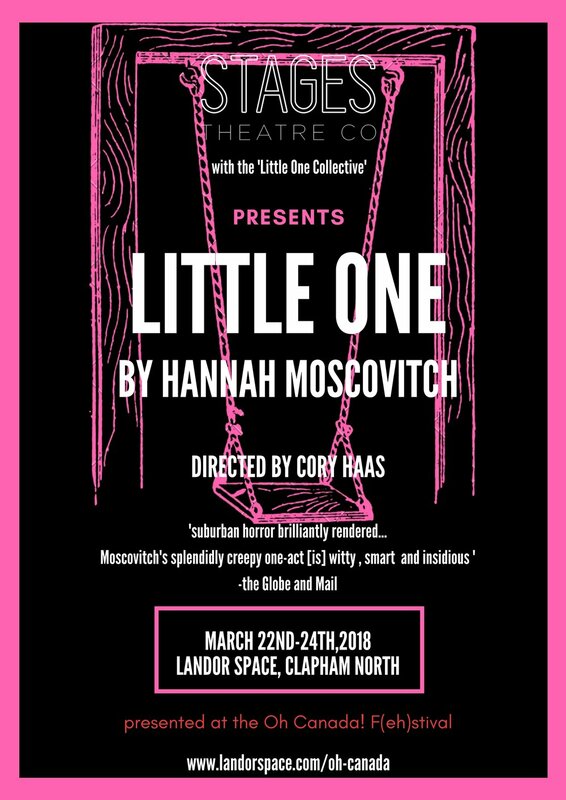 Whether you haven’t seen any Canadian work, want to broaden your horizons, or just love good theatre, join us throughout the week for readings, scratches, a musical theatre night and our main production LITTLE ONE by Siminovitch prize nominee, Hannah Moscovitch. With its eclectic programming, this f(eh)stival (get it? We say eh a lot), we are sure there will be something for everyone. We have programmed the best contemporary Anglophone and Francophone content, coming from exciting and innovative playwrights and theatre makers. Come join us at the Landor Space to see a slew of talent from both sides of the pond! This activity is supported by the Canada-UK Foundation. The first event in the Oh Canada! F(eh)stival is a Scratch Night celebrating five new pieces of Canadian writing, performed and directed by emerging artists. Several of these pieces will be guided by a stimulating set of limitations to challenge both writers and directors. The others encounter form and content in various ways. A welcomed way to start the week and to discover new Canadian work. On Tuesday we’ll be blasting through the canon of Canadian musical theatre, decade by decade, with performances from Canadian and UK musical theatre artists based in London. The performances will be accompanied by conversations exploring the history of Canadian musical theatre, and how it has inspired ground-breaking new material to hit Broadway and the West End. Peau considers family dynamics in the face of trauma and explores how those consequences evolve from childhood to adulthood. Peau foregrounds the attempts we make towards resilience and the desire to live on. This striking new play which is set in a phantasmagorical, tragic, and zany world is not to be missed through Marcotte’s slick, biting and funny writing! Oh My Irma is Haley McGee’s self-penned, multi award winning and internationally acclaimed solo piece. Originally presented in Toronto, at Theatre Passe Muraille in 2011, the show has gone on to tour extensively and has been performed in French and German. Haley McGee has agreed to re-visit her piece for the Oh Canada! F(eh)stival! It is the story of an odd young woman who finds herself before an audience. Her knees are bruised and there’s blood on her hands. She set out to solve a crime and ended up committing one of her own. Awkward, frail, beautiful, powerhouse, this macabre comedy is her defence. Toronto, the year 2020: There’s a spontaneous pregnancy epidemic and only Margaret gives birth – to a very unusual baby. She is quarantined in the far North. April, an eager anthropologist, arrives to chronicle Margaret and baby’s struggle to survive and becomes more involved than she anticipated. Georgina Beatty’s unsettling, darkly comic solo is set in a world where the Canadian North has become a desert and the oceans are deadzones. Originally presented at Toronto’s SummerWorks Performance Festival, this beautiful piece has received rave reviews and we are lucky to be able to present it in London. This reading is presented in association with BoucheWHACKED. Five young people expose their tastes, their knowledge, and share photos of everything what they have seen, thought, experienced or imagined. Shaping their image to short agreed phrases, they vainly seek to break free from formatting imposed on them by their means of communication. What defines identity, language, and human interaction in the era of online social networking? The F(eh)stival concludes with our main event, a three-night run of Little One. A chilling psychological thriller, Little One is the haunting story of adopted siblings Aaron and Claire – one the definition of normal, the other deeply disturbed and unpredictable – and the strange lives of their neighbours, a man and his mail-order bride. Hannah Moscovitch is a Siminovitch Prize and Govenor General’s Award nominee, her plays have received national recognition and has been called ‘the wunderkind of Canadian theatre’ by CBC Radio. 2017 © Landor Space. All rights reserved.